What is a CA Salvage or Branded Title? 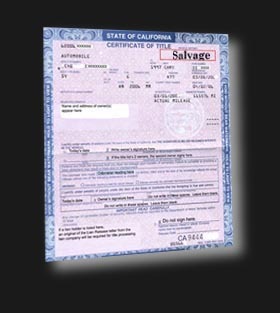 A CA salvage title, or branded title, is a result of an insurance company deeming an insured vehicle a total loss or a clear title vehicle going through an acquisition paperwork process, both will result in a CA salvage title when the vehicle is reregistered for the road. Just because an insurance company deems a vehicle a "total loss" doesn't mean its unsafe, most of the time it means the numbers work better for them if they don't fix the car. More about that here. Autogator purchases vehicles from many different sources, some from insurance salvage auctions, some from tow companies and many from private individuals. There are two ways that Autogator sells vehicles, with a salvage title or with a clear title. Clear Titles: Because Autogator sells vehicles that need repairs, all clear title repairable vehicles have to be sold to another dealer or broker (a broker is a dealer that is willing to purchase the vehicle and resell to the customer after the repairs are completed). Whether or not a vehicle is sold with a clear title is usually decided based on its value, back fees, etc. Salvage Titles: Most vehicles sold by Autogator will have a salvage title. We sell project vehicles, most needing either mechanical work or body work. To sell the vehicles with a clear title we would have repair them first, do a safety check, a smog test, and Autogator doesn't do this. To sell repairable vehicles without fixing them first, the paperwork must go through an acquisition process with the DMV, which creates a salvage title. There are never any back registration fees when we sell a vehicle with a salvage title, but a brake & lamp inspection is required and occasionally a CHP inspection is required. Autogator cannot issue a temporary moving permit so every vehicle purchased from us must be towed or hauled away by the new owner.